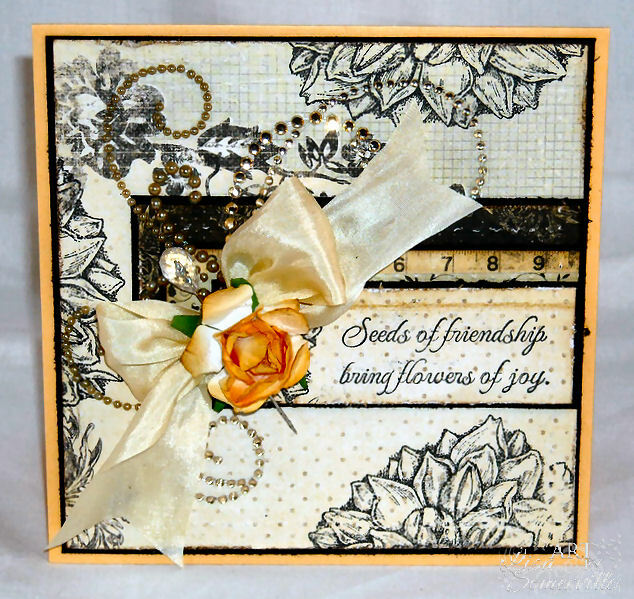 With the dusting of snow we had last week, my flowers are all gone...To create my card, I paired up the beautiful Dahlia from Our Daily Bread Designs, along with Prima's Printery Paper and this weeks Mojo Monday Sketch. I randomly stamped a portion of the Dahlia onto the Prima paper in Ranger Black Archival, distressed the edges with Prima's Distresser Tool, then sponged on some Ranger Gathered Twigs Distress Ink. The sentiment is from Our Daily Bread Designs, stamped in Ranger Black Archival. I used the Scor-Pal and Scor-Bug Embosser to add some Faux stitching and embellished using Zva Creative's Symmetrical Flourish Pearls in Taupe, Crystal Flourish II in Topaz, and a Sweet Peach Rose. this is just gorgeous. Love all the details. Lisa - this is a really beautiful card! Love your bow with the flower!! Gorgeous card, love the flower and the measuring tape too! Gorgeous! Loving the papers and embellishments. Lisa, this is gorgeous. I love the golden bow and gemstones. Thanks for joining us in our Bingo challenge at Craft Your Days Away. A beautiful card and such a beautiful bow and rose. Thanks for joining in our bingo challenge this fortnight at Craft Your Days Away.